Create a high-performance culture, and measurable success. The Evidence-Based Leadership Intensive is a 1-day workshop where leaders learn the robust, practical and engaging habits of Evidence-Based Leadership, to create a high-performance culture and measurable success. IS YOUR STRATEGY IMPROVING YOUR ORGANISATION’S PERFORMANCE? CAN YOU PROVE IT? Leading an organisation to high-performance is not about getting things done. Ticking boxes is not evidence of impact. We only get evidence of impact by measuring results. To prove that your organisation’s mission is being fulfilled, its vision is being realised, and its strategic goals are being achieved, you must measure them. TOO OFTEN, STRATEGY HAS NO MEASURABLE IMPACT. Strategy is hard to measure meaningfully, because it’s so broad and intangible. People are not engaged in aligning their results to the corporate strategy. Evidence-based leaders know what to focus on, what to monitor and what to leverage to move an organisation from guessing, to knowing, and then to performing. Evidence-based leaders know how to create a culture of high-performance and measurable success. IT’S NOT ABOUT HOW TO LEAD, IT’S ABOUT WHAT TO LEAD. Evidence-based leadership means practicing and inspiring the habits of high-performance. Evidence-Based Leadership is the roadmap to fulfil your mission, realise your vision, and achieve your strategic goals, sooner and with less effort. START WITH THE EBL 1-DAY INTENSIVE. 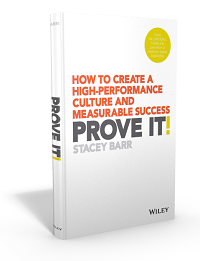 The Evidence-Based Leadership (EBL) framework is detailed in Stacey’s book, Prove It! The EBL 1-Day Intensive gives you the practical skills for six EBL habits so you can clarify, measure, cascade and execute your strategic direction, with deep engagement organisation-wide. The day combines discussion, case studies, and practical exercises working on your own goals and measures. IT’S FOR EXECUTIVES AND SENIOR LEADERS, EXCLUSIVELY. The senior leadership team, or Executive Team, of an organisation holds the responsibility for high-performance. They must practice it themselves, and then guide how the rest of the organisation will practice it. This EBL 1-Day Intensive is exclusively for senior leaders to learn the practical and engaging way to achieve this. By practicing evidence-based leadership, you’ll find it so much easier to lead your organisation to high-performance, and to inspire everyone throughout your organisation to do the same. * If you want your own in-house EBL Program for your entire leadership team, contact us for more information and fees. If you are outside Australia, New Zealand and Asia-Pacific, we will put you in touch with your local PuMP Partner. Imagine your strategy is now twice as easy to communicate, easier to measure, easier to cascade, easier to execute. What would that be worth to you? What would it be worth to your organisation? Stacey Barr is an evidence-based leadership and organisational performance measurement specialist. She is the author of two books, Practical Performance Measurement and Prove It! Stacey created PuMP in the 1990s, when she worked in the corporate world, to overcome her own struggles with how to measure performance. It quickly became a world-renowned methodology for practical and meaningful performance measurement. EBL has evolved alongside PuMP, as the specific application of PuMP principles to support senior leaders with the measurement, cascading and execution of their corporate strategy. Stacey is known for her practicality, and the way she takes abstract concepts like measurement and makes them clear, logical, engaging, and easy to apply. Mark Hocknell is our Licensed PuMP Partner Asia-Pacific, has been applying, facilitating and teaching PuMP and the EBL concepts since 2007. He delivers all our public and private PuMP Blueprint Workshops and private Evidence-Based Leadership Programs in Australia, New Zealand and Asia-Pacific. Mark is our most experienced EBL facilitator. He has many years of experience working with executive teams in medium to large organisations, and has a deep understanding of their challenges to lead high-performance organisations. Mark’s style is open and easy-going, engaging and collaborative. He’s known for his ability to encourage and inspire people to see things in new ways. He specializes in performance measurement, evidence-based leadership, and customer-centric business. Our 2019 dates for the public EBL 1-Day Intensive will be announced early in 2019.